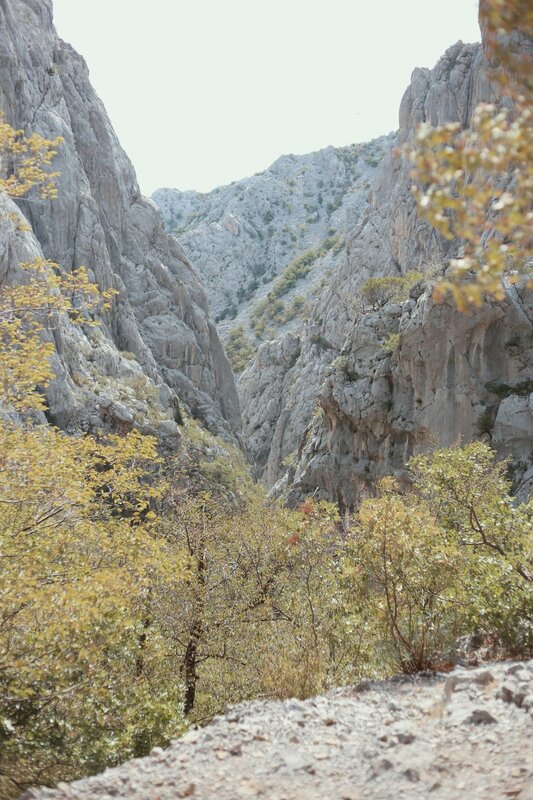 Paklenica is a national park located in Starigrad, nothern Dalmatia. It is at the southern slopes of the Velebit mountains and close to my fathers hometown of Zadar. There are these bunkers created by Josip Tito during the 1940's to 1950's amidst tension between former Yugoslavia and the Soviet Union, and the bunkers were suppose to be used as a shelter for the state. The only way to explore the park is through hiking and it is a huge destination for rock climbing for climbers all over the world. Even the house restaurants located on the path have to get all of their supplies by hiking and using donkeys! I've been hiking in these mountains before when I was young with my family and it is just as beautiful as I remember. This day in particular was a little windy and not as hot as the other days so it was perfect for a 6 hour hike. Yes 6 hours! And that is only a portion of the hike you can do, a 5 hour hike one way will get you close to the top. What I love about the park is how they really kept everything really authentic, they only had one tiny gift shop in the entrance and a renovated museum that teaches about the area and the bunkers. The views are worth the long hike. And I am a girl that will hike for hours because I really love it, but this time I was wearing converse shoes because I packed the most minimal suitcase for a euro trip, I doubt anyone will believe me on that. But this ended up being one of my favourite days on the trip. Once we reached the top we had dinner at one of the house restaurants, it is really exactly how it sounds. A family that had the house passed down now offers food and drinks to hikers and campers, they even created a b&b so you can stay overnight. But its as authentic as you can get, they actually use donkeys as transportation and taking a shot of moonshine is mandatory to pass into the house. I was stopped by the owner because I was a little behind my family taking photos. He insisted I take a shot with him and picked the most perfect one for me (so he proclaimed) a sage liqueur, and it was so good!! How did he know I was all about the sage? Then he let me take a ride on his donkey...that sounds very suggestive ha! but it was a real donkey and it would legit walk into their house. This whole experience is a must if you travel in Croatia, next time I am learning how to rock climb!